Perennial Seller: The Art of Making and Marketing Work that Lasts – by Ryan Holiday. Date read: 8/6/17. Recommendation: 9/10. You can't go wrong with any of Holiday's work. His latest is a great read for anyone who considers themselves a creative, and particularly insightful for writers and entrepreneurs. If you're thinking of writing a book or bringing an idea to life, start here and save yourself a few headaches. He outlines best practices for the creative process, along with the importance of positioning, marketing, and building a platform. The most important advice can be summed up as playing the long game. If you want to create something of lasting value, there are no shortcuts or paths to immediate gratification. Put in the work. People claim to want to do something that matters, yet they measure themselves against things that don't, and they track their progress not in years but in microseconds. They want to make something timeless, but they focus instead on immediate payoffs and instant gratification. The better your product is, the better your marketing will be. The hard part is not the dream or the ideas; it's the doing. It is the driving need that determines one's chances. You must have a reason–a purpose–for why you want the outcome and why you're willing to do the work to get it. To create something is a daring, beautiful act. The architect, the author, the artist–are all building something where nothing was before. Creating something that lives requires not just a reverence for the craft and a respect for the medium, but a real patience for the process itself. The risk for any creator is over-accounting for what's happening right in front of them...must think bigger and more long term than that. How within seemingly ordinary people there can exist depths of wisdom, beauty, and insight–and that if they put in the work to plumb those depths, they might reap incredible rewards. To wrestle with all these conflicting, difficult ideas that go into creating, you often need real silence. Meditative isolation, where you sit and wrestle with your project. The brilliant military strategist John Boyd utilized what he called "drawdown periods." After a one a.m. breakthrough, he'd spend weeks just looking at an idea, testing whether others had already come up with it, identifying possible problems with it. Only after this period ended would he begin the real work on the project. For one of my books I gave myself a January 1 start date for the writing. Two months before, in November, I entered by drawdown period. No more reading or rereading. Just thinking. Long walks. Resting. Preparing. A book should be an article before it's a book, and a dinner conversation before it's an article. Successfully finding and "scratching" a niche requires asking and answering a question that very few creators seem to do: Who is this thing for? Instead many creators want to be for everyone...and as a result end up being for no one. Picking a lane isn't limiting. It's the first act of empowerment. Stephen King believes that "every novelist has a single ideal reader" so that at various points in the process he can ask, "What will ____ think about this?" Just as we should ask "Who is this for?" we must also ask "What does this do?" A critical test of any product: Does it have purpose? Does it add value to the world? How will it improve the lives of the people who buy it? Yet far too many people set out to produce something that, if they were really honest with themselves, is only marginally better or different from what already exists. Instead of being bold, brash, or brave, they are derivative, complementary, imitative, banal, or trivial. The problem with this is not only that it's boring, but that it subjects them to endless amounts of competition. So much in the history of art and culture hinges on moments like this. Faced with soul-crushing feedback or rejection, how does the creator respond? With petulance and anger? With open-mindedness and interest? With obsequiousness and desperation? Or careful consideration that parses the signal from noise? As infuriating as it may be, we must be rational and fair about our own work. This is difficult considering our conflict of interest–which is to say, the ultimate conflict of interest. We made it. Do I feel like overriding this feedback because it's wrong, I ask myself, or is it because I don't want to hit pause and do more work? The fact is, most people are so terrified of what an outside voice might say that they forgo opportunities to improve what they are making. Remember: Getting feedback requires humility. It demands that you subordinate your thoughts about your project and your love for it and entertain the idea that someone else might have a valuable thing or two to add. You must be able to explicitly say who you are building your thing for. You must know what you are aiming for–you'll miss otherwise. You need to know this so you can make the decisions that go into properly positioning the project for them...Marketing then becomes a matter of finding where those people are and figuring out the best way to reach them. For creators, it's typically easier to reach the smaller, better-defined group. If you reach the smaller group and wow them, there will be many opportunities to spread outward and upward. Who is buying the first one thousand copies of this thing? Who is coming in on the first day? Who is going to claim our first block of available dates? Who is buying our first production run? The same article with a slightly different headline can have a tenfold spread in readership. One stands out; the other doesn't. Creators will often spend years making something but then rush through their descriptive copy in an hour. A great package on a great product is what creates an explosive reaction. Imagine if your product were for one group–say, successful adults with disposable income–but your branding violated what they expected in terms of style and appearance? Wealthfront changed its name from KaChing. My "book about Stoic philosophy," for example, had to become "a book that uses the ancient formula of the Emperor Marcus Aurelius to teach people how to not only overcome obstacles but thrive because of them." There are many different missions. Whatever yours is, it must be defined and articulated. Once that has occurred, there is one last thing you must do. You must deliberately forsake all other missions. If you've committed to doing something incredibly difficult that countless others have failed at before, you probably also shouldn't be juggling five other projects at the same time. You'll need to put 100 percent of your resources toward this one. Nothing has sunk more creators and caused more unhappiness than this: our inherently human tendency to pursue a strategy aimed at accomplishing one goal while simultaneously expecting to achieve other goals entirely unrelated. Only crazy people would compare themselves to people on totally different tracks. Jeff Goins makes the distinction between starving artists and thriving artists. One adopts all the tropes and cliches of the bohemians and supposed purity. The other is resilient, ambitious, open-minded and audience-driven. Who do you want to be? Which will propel your work the furthest? Don't delegate the marketing...You can cut back on a lot of things as a leader, but the last thing you can ever skimp on is marketing. Your product needs a champion. Not everyone has the dedication to make it and to make it work. Marketing is an opportunity for you to distinguish yourself, to beat out the other talented folks whose entitlement or laziness holds them back. I gave away more than a thousand copies of one of my books to marketing students...In the first month, sold 21 hard copies, 37 ebook. Took 5 months before the book sold 500 copies in a single month. Within 5 years, book had sold roughly 60,000 copies. Think about a favorite album, restaurant, or pair of shoes. How did you first get turned on to these? How do you find most of the things you like or consume on a regular basis? How did you find your favorite book of all time? "The problem for most artists isn't piracy, it's obscurity." In other words, we spend a lot of time insisting that nobody steal our work or get it for free...but we forget that being unknown is a far worse fate for an artist than being underpaid. 70% of book sales come from Amazon. What we've created is a central fact of existence to us–after all, we made it. But to most other people, it's optional. They can easily do without our work. A savvy creator embraces this reality and makes taking a chance on it as easy and frictionless as possible for the audience. I've watched an Instagram post from an influential person take a book to the top of Amazon; meanwhile, a New York Times profile about the same project had next to no impact. When a real person, a real human being whom others trust, says. "This is good," it has an effect that no brand, no ad, no faceless institution can match. If you want to reach influential people, make something that will make them look good....Make your audiences look good. Identifying influencers...if you're living and breathing what you do the answer should come naturally...who are the people who influence you too? Don't have to be famous, but they should matter a great deal to the audience you are trying to appeal to. Best way to ask someone to endorse or share your work...The best way is not to ask. Think relationship first, transaction second. I've always found that a critical part of attracting influencers is to look for the people who aren't besieged by requests. Authors are inundated with requests for blurbs from other authors; meanwhile, generals, academics, and CEOs are asked much more rarely...Try to find the people least likely to get a request from someone like you, and approach them first, instead of going where everyone else is going. Be bold and brash and counterintuitive not only in how you create your work but also in who you use to market it. In my experience, almost everyone–from brands to artists–overestimates the value of traditional PR. Much of the press that people chase is ephemeral and ineffectual, yet expensive and time-consuming to get. Media outlets have trouble getting people to pay for their own product–what makes you so sure they're going to be able to convince their readers and viewers to buy yours? Only areas where traditional press is underrated? Credibility and status. Newsjacking–James Altucher book launch at same time Bitcoin was blowing up. Announced he was accepting Bitcoin and got tons of bonus media attention. Advertising can add fuel to a fire, but rarely is it sufficient to start one. We are better off taking the money set aside for advertising and putting it into every other marketing bucket instead. Kevin Kelly: "1000 true fans"
Building an email list is a move toward self-sufficiency for any creator. By forming a direct and regular line of communication with your supporters, you avoid ever being disintermediated. I wasn't important or interesting enough for people to just sign up based on my name alone. So I came up with an idea: What if I gave monthly book recommendations? (The thinking being that one day I might recommend one of my own books to this list). Once a month for four years I sent this list out, and as a result it grew from ninety original sign-ups to the five thousand people to whom I announced my first book. By the time my next book came out two years later, the list was at more than thirty thousand, and today it's at eighty thousand. Building your list is not someone else's job. People will not beg you for the opportunity to join it. You can't buy subscribers. No list is built entirely through advertising. It will take work–sometimes years of work–for it to pay off. But it will be worth it. It is far better to measure your campaign over a period of years, not months. As Goethe's maxim goes, "The greatest respect an author can have for his public is never to produce what is expected but what he himself considers right and useful for whatever stage of intellectual development has been reached by himself and others." Most of the real money isn't in the royalties or the sales. For authors, the real money comes from speaking, teaching, or consulting. Bill Walsh (legendary 49ers coach) explained that his goal was to "establish a near-permanent 'base camp' near the summit, consistently close to the top, within striking distance." The actual probability of winning in a given year depended on a lot of external factors–injuries, schedule, drive, weather–just as it does for any mountain climber, for any author, for any filmmaker or entrepreneur or creative. We do know with certainty, however, that without the right preparation, there is zero chance of successfully making a run at the summit. Walsh made three such summits in eight years. Date read: 7/2/17. Recommendation: 9/10. Flips traditional marketing (and ad agencies) on its head in favor of the growth hacker mindset. Growth hacking still requires pulling customers in but it favors a more innovative, effective, and cheaper method of reaching the target audience. Holiday emphasizes the importance of Product Market Fit and building a product that generates explosive, contagious reactions from those who first see it. Great foundation to have in place before building any product, service or following. Digs into real examples of some of the most successful startups in Silicon Valley (Airbnb, Twitter, Dropbox, etc.) and how they were able to adapt, optimize, and make themselves indispensable in the process. Growth hackers believe that products–even whole businesses and business models–can and should be changed until they are primed to generate explosive reactions from the first people who see them. Airbnb went from a good but fairly impractical idea to an explosive and practical idea. -Orginally founders put air mattresses on their floor and offered free homemade breakfast to guests. -Repositioned as a networking alternative for conferences when hotels were booked up. -Pivoted to the type of traveler who didn't want to crash on couches or in hostels but was looking to avoid hotels. Instagram started as a location-based social network called Burbn (which had an optional photo feature). Core group of users flocked to one part of the app–photos and filters. Some companies like Airbnb and Instagram spend a long time trying new iterations until they achieve what growth hackers call Product Market Fit (PMF); others find it right away. The end goal is the same, however, and it's to have the product and its customers in perfect sync with each other. The books that tend to flop upon release are those where the author goes into a cave for a year to write it, then hands it off to the publisher for release. On the other hand, I have clients who blog extensively before publishing. They develop their book ideas based on the themes that they naturally gravitate toward but that also get the greatest response from readers...They test the ideas they're writing about in the book on their blog. The race has changed. The prize and spoils no longer go to the person who make it to market first. They go to the person who makes it to Product Market Fit first. Use the Socratic method: We must simply and repeatedly question every assumption. Who is this product for? Why would they use it? Why do I use it? Growth hacking still requires pulling your customers in. Except you seek to do it in a cheap, effective, and usually unique and new way. Knowing the outlets where they [Dropbox] intended to post the video (Digg, Slashdot, and reddit), they filled it with all sorts of jokes, allusions, and references that those communities would eat up. PR efforts are needed simply to reach out and capture, at the beginning, a group of highly interested, loyal, and fanatical users. If they are geeks, they are at TechCrunch or Hacker News or reddit or attending a handful of conferences every year. If they are fashionistas, they are regularly checking a handful of fashion blogs like Lookbook.nu or Hypebeast. If they are ____, like you and your founders are, they are reading and doing the same things you do every day. The best way to get people to do this enormous favor for you? Make it seem like it isn't a favor. Make it the kind of thing that is worth spreading and, of course, conducive to spreading. You can't just expect your users to become evangelists of your product–you've got to provide the incentives and the platform for them to do so. Dedicated and happy users are marketing tools in and of themselves. -Twitter: Found that users who followed 5-10 accounts on first day, much more likely to stick around. -Pinterest: Automatically follows a selection of high-quality Pinterest users so they don't have to hope users figure it out on their own. -Dropbox: Dragging at least one file into your dropbox, not just creating the account. When your product is actually relevant and designed for a specific audience, bloggers love to write about you. Lesson: Cheaply test your concept, improve it based on feedback, then launch. Lesson: Reduce barriers to entry; use targeted media and platforms to bring your first users on board. Lesson: Build your email list! Ask yourself: why would anyone sign up for a beta list for a new product or sign up the week it launches? The value proposition has to be overwhelming. If your product does not do that–even on a small scale for a much smaller audience–you need to go back to the drawing board until it does. As far as ad agencies go, I don't like their model. Why do you have to pay someone else to make/produce the content that you use to speak directly to your potential customers? It makes no sense to me. The growth hacker mindset still applies no matter what kind of business you're in: make your service indispensable, find some loophole or underexploited niche, encourage word of mouth, and finally, ruthlessly optimize based on data and feedback. Date read: 3/29/17. Recommendation: 8/10. If you're this far along in my reading list and you're on board with Stoicism, you'll enjoy this book. The greater your interest in Stoic philosophy, the more you're going to get out of the book. It's a tremendous resource. There's also a daily newsletter that offers brief overviews of many topics covered in the book. I don't normally recommend signing up for mailing lists, but this one is worth checking out. 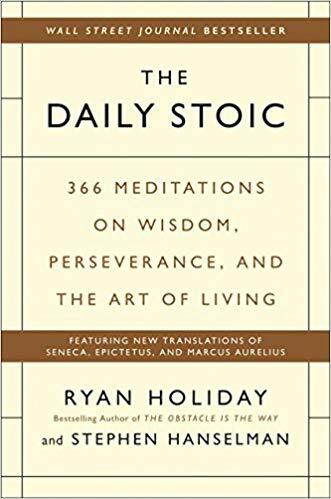 It's a great daily reminder and a solid introduction to Stoicism if you're looking for a place to start. Stoicism was a school of philosophy founded in Athens by Zeno of Citium in the early third century BC. Its name is derived from the Greek stoa, meaning porch, because that's where Zeno first taught his students. Painted porch (Stoa Poikilê). Stoicism assets that virtue (meaning, chiefly, the four cardinal virtues of self-control, courage, justice, and wisdom) is happiness, and it is our perceptions of things - rather than the things themselves - that cause most of our trouble. The single most important practice in Stoic philosophy is differentiating between what we can change and what we can't. What we have influence over and what we do not. Control your perceptions. Direct your actions properly. Willingly accept what's outside your control. The image of the Zen philosopher is the monk up in the green, quiet hills, or in a beautiful temple on some rocky cliff. The Stoics are the antithesis of this idea. Instead, they are the man in the marketplace, the senator in the Forum, the brave wife waiting for her soldier to return from battle, the sculptor busy in her studio. Still, the Stoic is equally at peace. Seneca uses the greek word euthymia, which he defines as: "believing in yourself and trusting you are on the right path, and not being in doubt by following the myriad of footpaths of those wandering in every direction." It is this state of mind, he says, that produces tranquility. Tranquility and peace are found in identifying our path and in sticking to it. Money only marginally changes life...external things can't fix internal issues. Anger is not impressive or tough - it's a mistake. It's weakness. Depending on what you're doing, it might even be a trap that someone laid for you. Imagine the power you'd have in your life and relationships if all the things that trouble everyone else - how thin they are, how much money they have, how long they have left to live, how they will die - didn't matter so much. What if, where others were upset, envious excited, possessive, or greedy, you were objective, calm, and clearheaded? Can you envision that? Imagine what it would do for your relationships at work, or for your love life, or your friendships. Remember that next time you hear someone ramble on about how the market decides what things are worth. The market might be rational...but the people who comprise it are not. At the end of your time on this planet, what expertise is going to be more valuable - your understanding of matters of living and dying, or your knowledge of the '87 Bears? Which will help your children more - your insight into happiness and meaning, or that you followed breaking political news every day for thirty years. There are many forms of taxes in life. You can argue with them, you can go to great - but ultimately futile - lengths to evade them, or you can simply pay them and enjoy the fruits of what you get to keep. Looking at the beautiful expanse of the sky is an antidote to the nagging pettiness of earthly concerns. And it is good and sobering to lose yourself in that as often as you can. Character is a powerful defense in a world that would love to be able to seduce you, buy you, tempt you, and change you. If you know what you believe and why you believe it, you'll avoid poisonous relationships, toxic jobs, fair-weather friends, and any number of ills that afflict people who haven't thought through their deepest concerns. That's your education. That's why you do this work. Spend some time–real, uninterrupted time–thinking about what's important to you, what your priorities are. Then, work toward that and forsake all the others. It's not enough to wish and hope. One must act–and act right. Would I be better saying words or letting my actions and choices illustrate that knowledge for me? Here is how to guarantee you have a good day: do good things. Any other source of joy is outside your control or is nonrenewable. But this one is all you, all the time, and unending. It is the ultimate form of self-reliance. Just because you've begun down one path doesn't mean you're committed to it forever, especially if that path turns out to be flawed or impeded. At the same time, this is not an excuse to be flighty or incessantly noncommittal. It takes courage to decide to do things differently and to make a change, as well as a discipline and awareness to know that the notion of "Oh, but this looks even better" is a temptation that cannot be endlessly indulged either. You have the power to use the Stoic exercise of turning obstacles upside down, which takes one negative circumstance and uses it as an opportunity to practice an unintended virtue or form of excellence. It can be so easy to get distracted by, even consumed by, horrible news from all over the world. The proper response of the Stoic to these events is not to not care, but mindless, meaningless sympathy does very little either (and comes at the cost of one's own serenity, in most cases). Joy, to Seneca, is a deep state of being. It is what we feel inside it us and has little to do with smiles and laughing. We tell ourselves that we need the right setup before we finally buckle down and get serious. Or we tell ourselves that some vacation or time alone will be good for a relationship or an ailment. This is self-deceit at its finest. The inexperienced and fearful talk to reassure themselves. The ability to listen, to deliberately keep out of a conversation and subsist without its validity is rare. Silence is a way to build strength and self-sufficiency. Think about someone you know who has character of granite. Why are they so dependable, trustworthy, excellent?Why do they have a sterling reputation? You might see a pattern: consistency. They are honest not only when it's convenient. They are not only there for you when it counts. You become the sum of your actions, and as you do, what flows from that - your impulses - reflect the actions you've taken. Choose wisely. The key to accomplishing that is to ruthlessly expunge the inessential from our lives. What vanity obligates us to do, what greed signs us up for, what ill discipline adds to our plate, what a lack of courage prevents us from saying no to. All of this we must cut, cut, cut. One way to protect yourself from the swings of fate - and from the emotional vertigo that can result - is by living within your means now. So today, we can try to get used to having and surviving on less so that if we are ever forced to have less, it would not be so bad. Overconfidence is a great weakness and a liability. But if you are already humble, no one will need to humble you - and the world is much less likely to have nasty surprises in store for you. If you stay down to earth, no one will need to bring you - oftentimes crushingly so - back down. Anyone can get lucky. There's no skill in being oblivious, and no one would consider that greatness. On the other hand, the person who perseveres through difficulties, who keeps going when others quit, who makes it their destination through hard work and honesty? That's admirable, because their survival was the result of fortitude and resilience, not birthright or circumstance. We must prepare in our minds for the possibility of extreme reversals of fate. "Anyone who truly wants to be free," Epictetus said, "won't desire something that is actually in someone else's control, unless they want to be a slave." We could look at the upcoming day and despair at all the things we don't control: other people, our health, the temperature, the outcome of a project once it leaves our hands. Or we could look out at that very same day and rejoice at the one thing we do control: the ability to decide what any event means. Inherent to the Stoic concept of Sympatheia is the notion of an interconnected cosmos in which everything in the universe is part of a larger whole. No amount of travel or reading or clever sages can tell you what you want to know. Instead, it is you who must find the answer in your actions, in living the good life - by embodying the self-evident principles of justice, self-control, courage, freedom, and abstaining from evil. Who Gets The Lion's Share? The average person somehow manages to squeeze in twenty-eight hours of television per week - but ask them if they has time to study philosophy, and they will probably tell you they're too busy. You don't have to believe that there is a god directing the universe, you just need to stop believing that you're the director. As soon as you can attune your spirit to that idea, the easier and happier your life will be, because you will have given up the most potent addiction of all: control. Our understanding of what something is is just a snapshot - an ephemeral opinion. The universe is in a constant state of change. Nothing is exempt from this fluidity, not even the things we hold most sacred. Leave other people to their faults. Nothing in Stoic philosophy empowers you to judge them - only to accept them. Especially when we have so many of our own. Devastation is a factor of how unlikely we considered that event in the first place. No one is wrecked by the fact that it's snowing in the winter because we've accepted (and even anticipated) this turn of events. Attachments to an image you have of a person, attachments to wealth and status, attachments to a certain place or time, attachments to a job or to a lifestyle. All of those things are dangerous for one reason: they are outside of our reasoned choice. How long we keep them is not in our control. You don't get a prize at the end of your life for having consumed more, worked more, spent more, collected more, or learned more about the various vintages than everyone else. You are just a conduit, a vessel that temporarily held or interacted with these fancy items. Date read: 1/30/17. Recommendation: 9/10. One of the most accessible modern introductions to Stoic philosophy. Holiday examines the inevitable obstacles we all face in life, how to better frame them as opportunities to practice virtue, and how to harness them to create momentum of our own. He structures the book around the three interconnected disciplines required to overcome any obstacle: perception, action, and will. There's an incredible amount of knowledge packed into these 200 pages. No matter what challenges you face or where you're trying to go, it's a great resource for fine tuning your attitude, strategy, and mental toughness. Inspired by Marcus Aurelius, "The impediment to action advances action. What stands in the way becomes the way." Obstacles as an opportunity to practice some virtue: patience, courage, humility, resourcefulness, reason, justice, and creativity. As it turns out, this is the one thing all great men and women of history have in common. Like oxygen to a fire, obstacles became fuel for the blaze that was their ambition. Not "be positive" but learn to be ceaselessly creative and opportunistic. Not: This is not so bad. But: I can make this good. Sangfroid: unflappable coolness under pressure. Most people can't access this part of themselves, they are slaves to impulses and instincts they have never questioned. Talent is not the most sought-after characteristic. Grace and poise are, because these two attributes precede the opportunity to deploy any other skill. When people panic, they make mistakes. They override systems. They disregard procedures, ignore rules. They deviate from the plan. They become unresponsive and stop thinking clearly. They just react - not to what they need to react to, but to the survival hormones that are coursing through their veins. This is the skill that must be cultivated - freedom from disturbance and perturbation - so you can focus your energy exclusively on solving problems, rather than reacting to them. In the writings of the Stoics, we see an exercise that might well be described as Contemptuous Expressions. The Stoics use contempt as an agent to lay things bare and to "strip away the legend that encrusts them." -Allows us to see things as they really are. Objectivity means removing "you" - the subjective part - from the equation. Just think, what happens when we give others advice? Their problems are crystal clear to us, the solutions obvious. Perspective is everything...When you can break apart something, or look at it from some new angle, it loses its power over you. Focusing exclusively on what is in our power magnifies and enhances our power. But every ounce of energy directed at things we can't actually influence is wasted - self-indulgent and self-destructive. Remember that this moment is not your life, it's just a moment in your life. Focus on what is in front of you, right now. Ignore what it "represents" or it "means" or "why it happened to you." Psychologists call it adversarial growth or post-traumatic growth. "That which doesn't kill me makes me stronger" is not a cliche but fact. The struggle against an obstacle inevitably propels the fighter to a new level of functioning. The extent of the struggle determines the extent of the growth. We forget: In life, it doesn't matter what happens to you or where you came from. It matters what you do with what happens and what you've been given. And the only way you'll do something spectacular is by using it all to your advantage. It's okay to be discouraged. It's not okay to quit. To know you want to quit but to plant your feet and keep inching forward – that's persistence. Our capacity to try, try, try is inextricably linked with our ability and tolerance to fail, fail, fail. The one way to guarantee we don't benefit from failure - to ensure it is a bad thing - is to not learn from it. Everything we do matters...Everything is a chance to do and be your best. Only self-absorbed assholes think they are too good for whatever their current station requires. You don't convince people by challenging their longest and most firmly held opinions. You find common ground and work from there. Or you look for leverage to make them listen. Sometimes you overcome obstacles not by attacking them but by withdrawing and letting them attack you. You can use the actions of others against themselves instead of acting yourself. It means that very few obstacles are ever too big for us...Remember, a castle can be an intimidating, impenetrable fortress, or it can be turned into a prison when surrounded. Adversity can harden you. Or it can loosen you up and make you better - if you let it. In many battles, as in life, the two opposing forces will often reach a point of mutual exhaustion. It's the one who rises the next morning after a long day of fighting and rallies, instead of retreating - the one who says, I intend to attack and whip them right here and now - who will carry victory home...intelligently. When the cause of our problem lies outside of us, we are better for accepting it and moving on. For ceasing to kick and fight against it, and coming to terms with it. The Stoics have a beautiful name for this attitude. They call it the Art of Acquiescence. The hubris at the core of this notion that we can change everything is somewhat new. Not: I'm okay with this. Not: I think I feel good about this. But: I feel great about it. Because if it happened, then it was meant to happen, and I am glad that it did when it did. I am meant to make the best of it. Stop putting that dangerous "I" in front of events. I did this. I was so smart. I had that. I deserve better than this. No wonder you take losses personally, no wonder you feel so alone. You've inflated your own role and importance. Death doesn't make life pointless, but rather purposeful. Embracing the precariousness of our own existence can be exhilarating and empowering. The philosopher and writer Nassim Nicholas Taleb defined a Stoic as someone who "transforms fear into prudence, pain into transformation, mistakes into initiation and desire into undertaking." Date read: 1/5/17. Recommendation: 10/10. My favorite Ryan Holiday book. If you haven't read any of his work yet, start here. It's a great look into how–in an effort to nurse our ego–we often act in opposition to our best interests. He discusses how to leverage ideas from Stoic philosophy, the pitfalls of self-narrative, and the importance of being a lifelong learner. Numerous life lessons and productive mental models packed into a quick read. Along with Tribe by Sebastian Junger, this is the book I've gifted the most in the past year. Just one thing keeps ego around - comfort. Pursuing great work - whether it is in sports or art or business - is often terrifying. Ego soothes that fear. It's a salve to that insecurity. Replacing the rational and aware parts of our psyche with bluster and self-absorption, ego tells us what we want to hear, when we want to hear it. Ego is stolen. Confidence is earned. We build ourselves up with fantastical stories, we pretend we have it all figured out, we let our star burn bright and hot only to fizzle out, and we have no idea why. These are symptoms of ego, for which humility and reality are the cure. You must practice seeing yourself with a little distance, cultivating the ability to get out of your own head. Detachment is a sort of natural ego antidote. It's easy to be emotionally invested and infatuated with your own work. Any and every narcissist can do that. What is rare is not raw talent, skill, or even confidence, but humility, diligence, and self-awareness. Be action and education focused, and forgo validation and status. Almost universally, the kind of performance we give on social media is positive. It's more "Let me tell you how well things are going. Look how great I am." It's rarely the truth: "I'm scared. I'm struggling. I don't know." So what is scarce and rare? Silence. The ability to deliberately keep yourself out of the conversation and subsist without its validation. Silence is the respite of the confident and strong. Doing great work is a struggle. Impressing people is utterly different from being truly impressive. The art of taking feedback is such a crucial skill in life, particularly harsh and critical feedback...The ego avoids such feedback at all costs. On Eleanor Roosevelt: She had purpose. She had direction. She wasn't driven by passion, but by reason. Kareem Abdul-Jabbar: Used one word to describe the style of his famous coach [John Wooden]: "dispassionate." As in not passionate. Wooden wasn't about rah-rah speeches or inspiration. He saw those extra emotions as a burden. Instead his philosophy was about being in control and doing your job and never being "passion's slave." Neither of them [Wooden or Roosevelt] were driven by excitement, nor were they bodies in constant motion. Instead, it took them years to become the person they became known as. It was a process of accumulation. Passion typically masks a weakness. It's breathlessness and impetuousness and franticness are poor substitutes for discipline, for mastery, for strength and purpose and perseverance. Passion is seen in those who can tell you in great detail who they intend to become and what their success will be...but they cannot show you their progress. Because their rarely is any. How can someone be busy and not accomplish anything? Well, that's the passion paradox. Clear the path for the people above you and you will eventually create a path for yourself. When you are just starting out, we can be sure of a few fundamental realities: 1) You're not nearly as good or as important as you think you are; 2) You have an attitude that needs to be readjusted; 3) Most of what you think you know or most of what you learned in books or in school is out of date or wrong. Attach yourself to people and organizations who are already successful. It doesn't degrade you when others treat you poorly; it degrades them. It is a timeless fact of life that the up-and-coming must endure the abuses of the entrenched. The question to ask, when you feel pride, then, is this: What am I missing right now that a more humble person might see? What am I avoiding, or running from, with my bluster, franticness, and embellishments? It will be a lonely fight to be real, to say "I'm not going to take the edge off." To say, "I am going to be myself, the best version of that self. I am in this for the long game, no matter how brutal it might be." No matter what you've done up to this point, you better still be a student. If you're not still learning, you're already dying. It is not enough only to be a student at the beginning. It is a position that one has to assume for life. Learn from everyone and everything. An amateur is defensive. The professional finds learning (and even, occasionally, being shown up) to be enjoyable; they like being challenged and humbled, and engage in education as an ongoing and endless process. Narrative is when you look back at an improbable or unlikely path to your success and say: I knew it all along. Instead of: I hoped. I worked. I got some good breaks. Or even: I thought this could happen. Crafting stories out of past events is a very human impulse. It's also dangerous and untrue. Writing our own narrative leads to arrogance. It turns our life into a story - and turns us into caricatures - while we still have to live it. A great destiny, Seneca reminds us, is great slavery. All of us waste precious life doing things we don't like, to prove ourselves to people we don't respect, to get things we don't want. You need to know what you don't want and what your choices preclude. Because strategies are often mutually exclusive. One cannot be an opera singer and a teen pop idol at the same time. Life requires those trade-offs, but ego can't allow it. So why do you do what you do? That's the question you need to answer. Stare at it until you can. Only then will you understand what matters and what doesn't. Only then can you say no, can you opt out of stupid races that don't matter, or even exist. That's what we're after here. That's the transcendental experience that makes our petty ego impossible. Courage, for instance, lies between cowardice one one end and recklessness on the other. Generosity, which we all admire, must stop short of either profligacy and parsimony in order to be of any use. Where the line - this golden mean - is can be difficult to tell, but without finding it, we risk dangerous extremes. Ego loves this notion, the idea that something is "fair" or not. Psychologists call it narcissistic injury when we take personally totally indifferent and objective events. Robert Greene: There are two types of time in our lives: dead time, when people are passive and waiting, and alive time, when people are learning and acting and utilizing every second. Every moment of failure, every moment or situation that we did not deliberately choose or control, presents this choice: Alive time. Dead time. You will be unappreciated. You will be sabotaged. You will experience surprising failures. Your expectations will not be met. You will lose. You will fail. How do you carry on then? Your potential, the absolute best you're capable of - that's the metric to measure yourself against. Your standards are. Winning is not enough. People can get lucky and win. People can be assholes and win. Anyone can win. But not everyone is the best possible version of themselves. Attempting to destroy something out of hate or ego often ensures that it will be preserved and disseminated forever.